Less than an hour's drive away from St Petersburg, this small town is famous for its former fortress and prison and its simple ancient architecture. The history of the town of Shlüsselburg began with the fortress that was founded in 1323 by the great prince of Novgorod Georgii Danilovich, in the Zaretskii state, on the island of Orekhovo. The island owes its name to its shape (“orekh” means “nut”) and to the multitude of hazel shrubs growing there. 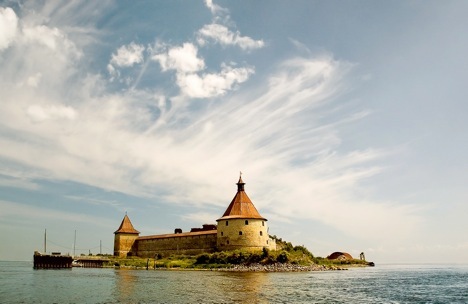 The fortress was built to defend the Novgorod lands from the Swedes. Later the fortress was rebuilt and fortified. As time went by, stone structures replaced the wooden ones, and peasant houses sprung up on the banks of the Neva River around the fortress. Swedish forces attacked the fortress several times, and in 1612 it was captured and renamed Noteburg (“Nut City”). But after nearly a century, in the course of the Northern war, the Russian army won the fortress back again. Peter I named it Shlüsselburg (which translated from the German means “Key City”), because thanks to the taking of this Swedish bastion, a passage to the Neva opened up for the Russian fleet, which consequently gained entry to the Baltic sea. The victory salvoes had not yet died down yet when Shlüsselburg began to be widened, developed, and fortified. Soldiers' barracks were constructed, as well as the Mint castle, the Lord's house, and the Church of John the Baptist. A network of bypass channels was dug out as well. Construction continued until the end of the 18th century and, when the fortress assumed the appearance of a forbidding giant, the building of the “Secret House” (a dark prison, surrounded by tall walls) began on its territory. Something akin to a prison had existed on the territory of the fortress prior to that as well, in the form of several penitentiary cells where insubordinate soldiers were imprisoned. On certain occasions, famous personalities would be imprisoned in the fortress among the common folk. Tsarina Evdokia Federovna, born Lopukhina, was the first of such prominent prisoners. After the tsarina, Princess Maria Alekseevna shared the same fate. Following her, Prince Dmitrii Mikhailovich Golitsyn was imprisoned in Shlüsselburg. After that, Vladimir Vladimirovich Dolgorukii was imprisoned, who was followed by the fortress’s longest serving and last of such illustrious prisoners, Tsarevich Ivan VI. Shlüsselburg was an ideal place to get rid of people who were problematic for the state. Isolated from the world, like an illusive ghost, it rested among the waters of the Neva. Even the climate was different on the island. With the damp and chilly climate, even the summer would arrive reluctantly, and the harsh winters decimated not only the prisoners, but also soldiers who were serving behind the walls of the stronghold. There was no shortage of prisoners, and in 1826, the “Secret House” became the place of imprisonment for the Decembrists: Ivan Pushchin, Vilgelm Kiukhelbekher, the brothers Mikhail and Nikolai Bestuzhev, Aleksandr and Iosif Podzhino, and others. The tired cells quickly found new guests, many of who would not even last through half of their sentences. Tuberculosis and consumption were the cruelest of persecutors in Shlüsselburg. The incarcerated often simply lost their minds during the first year of their imprisonment. Moreover, the inhabitants of the fortress's cells were deprived of their names: they were assigned consecutive numbers, and only the fortress's captain knew whose identity was concealed behind each code. People tried to end their lives here in all possible ways. The motto of the “Secret House” read: for disobedience or for insubordination against the guard – punishment. Prisoners intentionally poured soup on the guards or shouted out obscenities – they preferred the consequences of these transgressions to having to suffer the agony of darkness. The following day the offender was either hanged or shot. It became apparent later on that one building clearly did not suffice to house all offenders against the fatherland. The edifice of the “New Prison,” where the “Narodovoltsy” (members of the People's Will) would be imprisoned, was constructed on the territory of the fortress. An aura of notoriety grew around the fortress. It became known as the island of the dead. Shlüsselburg acquired the reputation of the town of the dead: one did not return from there, and a sentence to imprisonment on the island was equal to the death sentence. The history of the Shlüsselburg prison ended along with the outbreak of the February revolution in 1917. After brief negotiations, the commissioner of the prison, Viliam Zimberg, surrendered the keys to the fortress to workers of the Shlüsselburg gunpowder factory. On March 1, 1917, all of the prisoners were set free, and all the prison buildings were set on fire. Despite that, the fortress was not destroyed, and in 1929, after a reconstruction, a museum that would be in existence until the Second World War was opened here. In 1941, the fortress served again as a defensive fortification on the first line of the Leningrad front. The Shlüsselburg garrison resisted the onslaught of the Germans for over 500 days and prevented the “Road of Life” over the Ladoga Lake from being severed despite the fact that for each bomb flown by plane to Leningrad, one was reserved for the Shlüsselburg fortress. In 1985, near the ruined church (instead of being restored, it was preserved as a war memorial), a monument dedicated to the defenders of the fortress during the Second World War was unveiled, and it leaves an equally memorable impression as the cells that over the ages had been used for solitary confinement. The Old Ladoga Canal, which was opened in 1731 to vessel traffic and as a bypass to Lake Ladoga, divides contemporary Shlüsselburg into two parts. It connects the mouth of the Neva River with the mouth of Volkhov near the town of Novaya Ladoga. Even though many buildings in the town of Shlüsselburg weren’t spared from destruction during the Second World War, with the fortress itself sustaining extensive damage, many cultural monuments remain and the fortress has been undergoing reconstruction since the 1960s. The Old Ladoga Canal was constructed between 1719 and 1731 for purpose of providing safe passage for ships along the southern shore of the turbulent Lake Lagoda. The Russian Emperor Peter I personally worked on the plan for the Ladoga bypass channel and determined its final size: the channel began in Shlüsselburg and ended in Novaya Ladoga. General Minikhin was appointed to oversee the channel's construction. In 1731, the Channel of Peter the Great (at the time one of the major aquatic structures in Europe) was opened to vessel traffic. However, over time the channel became shallow and overgrown. A huge anchor of the admiralty from the time of Peter the Great, which was raised from the bottom of the Neva River near Shlüsselburg, can be seen on one of the shores of the Old Ladoga Canal. In contrast to its predecessor, the situation on the New Ladoga Canal is not nearly as precarious. The channel forms a part of the Volga-Baltic waterway, and it is open to small boat traffic. The town of Shlüsselburg itself is famous for its old parks, alleys, and views of Ladoga Lake and the Neva. A statue of Lenin sculpted by V. Sychev remains in Victory Park (Park Pobedy), along with some armaments and mines from the time of the Second World War that stand as reminders of the role that Shlüsselburg played in the defense of the “Road of Life” and the Battle of Leningrad. Other architectural landmarks include the Petrovsky Bridge that stands on granite columns over the Old Ladoga Canal and from which it is convenient to go for walks to the chapel in the Red square, designed by the architect Ershev, to the St Nicholas church, where services are held during winter months, to the cathedral of the Annunciation. The first church on the location of the cathedral of Annunciation was built in 1728. It was named to commemorate the dilapidated and eventually dismantled church of Annunciation that stood in the Oreshek fortress. Later, a wooden church was rebuilt with stone thanks to the financial investment provided by Colonel Belov and the Sibilevs. In 1864, the church of the Annunciation was transformed into a cathedral. Later, the cathedral was renovated under the supervision of architect Karpov. It is currently undergoing restoration. No less remarkable is the Gorbatyi (Hunched) bridge, with its floodgate and accompaniment of aquatic structures from the classical period; the Museum of the town's history on the Factory Island; and a network of channels, along which the old and contemporary buildings of the Neva dockyards are situated.